When something hasn’t changed for decades, and a company comes along claiming they suddenly know how to do it better, I’m usually a little skeptical. They are “Zero Drop,” meaning the heel and the forefoot are the same distance from the ground (Side Note: This has nothing to do with the minimalist craze. All of Altra’s shoes are fully cushioned as well). They utilize a “Foot Shaped” toe box. You have to really see it to fully understand, which you can do here. Basically instead of the toe-box cutting down on and compressing the toes, your toes can relax and spread out in a larger area. Both of these philosophies go against the grain, and when made standard across the entire brand, the buzzwords had me a bit concerned. I’ll be honest, it took me awhile to even consider giving Altra shoes a shot. It wasn’t until I received a free pair to test out as part of the Runner’s World Half and Festival a few months back, that I even put a pair on my feet. I should note here that I wasn’t required to write about the shoes, and will not receive any additional benefits for sharing my thoughts. I chose the Olympus trail shoes for my trial, because at that point, I was running the majority of my miles in Hokas, and I thought the max cushioned Olympus would be a good option for comparison purposes. Over the course of 3 weeks leading up to the Runner’s World event, I put about 50 training miles on the shoes and wore them for all 35 miles of a 50k. The cliff notes for this review would tell you that I really like these shoes. A lot. And after meeting with the owners in Bethlehem, hearing their story, and listening to the philosophy behind the shoe, I like them that much more. But you don’t read blogs for the cliff notes, right? Let’s get down to the details. Here are the 5 things I’m looking for in a shoe, and how the Altra Olympus shoes hold up. First things first, a shoe has to be comfortable. I want to slip my foot in and immediately feel like I can wear that shoe for several hours of running. The slightest discomfort will amplify over the miles, making a shoe not even worth trying. The toe box is where it’s at. It takes awhile for your toes to get use to all that extra room, but once they do, you can feel them relaxing and spreading out. It’s very freeing. The max cushion in the Olympus gives the same “running on clouds” feel that that I loved in the Hokas. My heel locks in perfectly in the back. No rubbing there. My blister problem is gone for the first time since I started running ultras. It’s seriously amazing. Want to know how amazing? Check out this photo of my toes post MMT100 (warning: it’s gross). Running on dirty, muddy trails means you need a shoe with good grip. Slip-n-slides are for play time, not run time. How a shoe’s lugs are designed will determine how well they cling to the trail. I want a trial shoe with good lugs. The Olympus performs above average when gripping the trail. Aside from some super slick days where few shoes would hold up very well, I’ve had minimal issues with my feet not locking in to the terrain. But I do have to mention an unfortunate issue I experienced during that recent 50k. I’m not sure it belongs in this section, but this is as good as any. During the Comberland Trail 50k, we ran on a particularly wet course with major elevation gain (somewhere around 6000ft). The constant up and down in soaked shoes caused the insole to slide and bunch up in the toe box. That meant that not only were my feet sliding within the shoe, but my toes were being squashed by all the bunching. I had to remove my shoes twice to fix it. I raised this issue with the owners, and they assured me they already knew of the problem, which only happens on courses exactly like the CT 50k, and that it would be fixed in the next model. I believe them. I’ve worn these shoes at least 50 times since then, and have never had it happen again. But it’s important enough for me to mention in this review. Because of that issue, I’m docking a few points in this section. What would have normally been a 4 out of 5 is being reduced. A shoe should create an atmosphere in which you are running at or near your natural stride. Some heavy or high heel-to-toe drop shoes cause adjustments in your stride that aren’t natural. As much as traditional shoe companies like to say that can be a good thing, in my opinion anything different than what comes naturally is a harmful. A good shoe prevents those unwanted adjustments to your stride. Another impressive showing in this section. For a long time I said that a 4mm heel-to-toe drop was what worked best for me. I no longer believe that. The Zero Drop technology works with my stride perfectly, and I’ve seen nothing but positive benefits from the way these shoes affect how I’m running. The one caveat here is probably the max cushioning, which is something I chose myself (because I like it). That extra cushion does give your heel a bigger safety net to land first, which isn’t really a good thing. But that’s a reflection on what I like, not on the shoe’s design. Altra even have a disclaimer about that in the shoe description, which I love. Trail running is tough on shoes. Sharp rocks slice through the upper, gnarly terrain eats away at the sole, and mud and dirt grind away at the seams. After just a few runs, it’s easy to tell if a company hasn’t designed the shoe properly for trails. With probably 150-200 miles on the shoes so far, I’m seeing very little ware. There is some slight separation between the upper and rubber side on one of the shoes, but that is of minimal concern. The soles look hardly worn, and the tip of the toe box, where I typically have the most trouble, is holding up nicely. Let’s be real for a minute. We’re all a little vain. If a shoe looks too goofy, I’m going to have a hard time wearing it. This is probably the least important rating, but one I’ve got to include. Altra does a great job with design and color selection. They are sleek but don’t draw too much attention, exactly what I look for in a shoe. Altra also does an incredible job at not making the max cushion in the Olympus, for example, look like moon shoes. Compare the Olympus to any Hoka, and you’ll see what I’m talking about. The Foot Shaped toe box, however, throws things off. It just looks different than basically any other shoe out there. The benefits of that toe box significantly out-weigh the cons of appearance, of course, but it’s true. They look a little funny until you get used to them. 1) A second top lace hole, like you’d see in many hiking boots. This allows the runner to adjust the lacing to fit their needs. 2) All shoes in their trail running line include the “Gaiter Trap“, a built in way to attach a shoe gaiter that keeps out rocks and trail debris. Brilliant idea. Score: I wish I gave bonus points for these two things, but I can’t change the rules now. As you can probably tell from the scores, I’m a fan of the Olympus. To take that one step further, I’m a real believer in Altra shoes. It’s been awhile since I discovered a brand and really believed that their products were better than most of what the competition has to offer..
That’s the way I feel about Altra. Does this shoe have a few flaws and ways to improve? Of course. 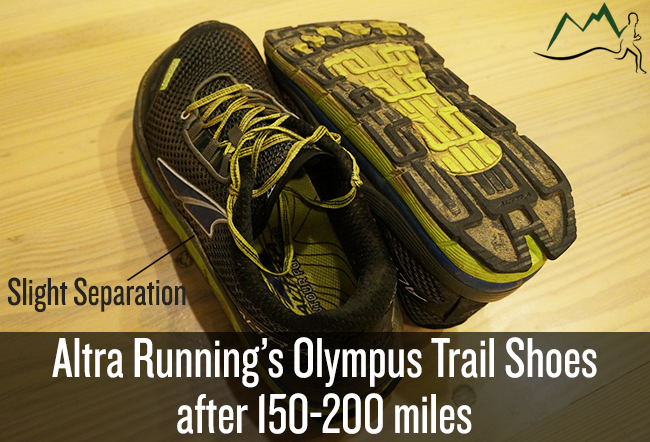 But how Altra is approaching their shoes and design is really exciting, and shines through the Olympus. Now go get you a pair. You won’t regret it. Thank you for the review! I listened to the No Meat Athlete podcast you and Matt did on Altras and was impressed. One question I haven’t found an answer to, though, is can you alternate between Altras and standard running shoes? Or once you’re used to Altras, should you stick exclusively with them? I like to alternate shoes based on the day, and I’m not ready to buy two pairs of Altras to balance out the wear. I’ve been running in the Altra Olympus shoes for several months now on the streets and in the parks of Paris. I love them! You said that your heal just locks in, no rubbing. What size do you wear? I love everything about Altras so far (I have 4 different pairs) but I just can’t get them to lock down on my foot. My heel is always slipping, even if I tie the shoe tight enough to bruise my foot. It is like someone just took a shoe that was designed for a 9.5 size shoe and made it a 13, without thinking it through all the way. I tried a 12.5 but then my toes hit the end. Any suggestions on how to get it to lock in? I have tried multiple lacing styles. The upper just doesn’t seem to grab my foot. You recommend the most expensive pair… Is there a good pair with 0 drop, good traction, etc that hits a less expensive price point? I just bought a pair of Altra Olympus 2.0 shoes. Thank You, Altra for making these shoes. They are heavenly to walk, run or hike in. Love the roomy toe box and zero drop. Fantastic. Like them better than Hokas. No stress on knees either.